Jobs in the Netherlands demand more than the Netherlands visa and just the obvious Netherlands cover letter and Netherlands CV writing and translation - it requires careful preparation. You will face problems that in all probability did not even cross your mind when you become interested in Netherlands jobs. Do not take too lightly the influence the Netherlands visa can have on the end result of your adventure! For example, you will experience the unfamiliar immigration rules and practices, strange job application procedures, bizarre job selection trends and weird management culture. Most visits to the Netherlands are trouble-free but you should be aware of the global risk of indiscriminate international terrorist attacks, which could be against civilian targets, including places frequented by foreigners. If you want to come to the Netherlands for a short time for a reason such as a holiday, business trip or family visit, and your country does not have a non-visa agreement with the Netherlands, then you need to apply for a short stay visa. The Schengen visa, also known as a short stay visa (C-visa), is for a temporary stay of up to 90 days (over a 180 day period) in the Schengen Area including the Netherlands. The 180 day period starts the day you enter the Netherlands or another Schengen country. - Proof of financial independence or support during your stay in the Netherlands (at least 34 euros per person per day)such as bank statements, cash or a legalised declaration from the person who will sponsor your stay. This person must also meet a minimum income level. The transit visa or airport transit visa (A-visa) is for international airport passengers making a stopover at an airport (such as Schiphol) in the Netherlands or another Schengen country, while travelling to a destination outside the Schengen area. With a transit visa you are not permitted to leave the airport. If you wish to exit the airport or continue your journey by car, train or bus to another Schengen country then you need to apply for a Schengen visa. The return visa is for internationals living in the Netherlands who have an urgent reason to travel abroad such as a family wedding, illness or death, and whose residence permit is either lost, stolen or being processed. The return visa allows you to travel abroad and then legally re-enter the Netherlands, even if your residence permit is lost or invalid. The return visa is a national (Dutch) visa so it is not valid in other Schengen nations. You can apply for a return visa at your closest IND desk in the Netherlands. If you want to come to the Netherlands for more than 90 days, and you are required to have a Schengen visa, then you need to apply for an MVV and a residence permit (TEV Procedure) before you travel. 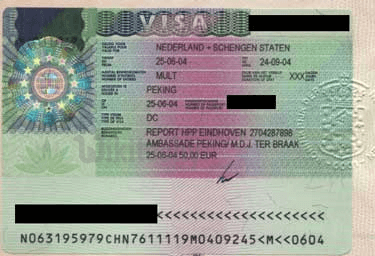 The MVV (Machtiging tot Voorlopig Verblijf) is similar to a visa because it grants entry to the Netherlands, however it is actually a provisional residence permit. The MVV allows you to enter the Netherlands as a potential resident rather than a tourist. The MVV also allows you to stay in the Netherlands while your residence permit application is being processed. Before applying, please ensure you are very clear on your ‘purpose of visit’ – do remember we are here to assist and help you through the entire visa application process but are not permitted to advise or guide you on choosing a visa category. Since our work is primarily administrative in nature, we have no say on whether you will be granted a visa and how long it will take to process, as this is entirely the prerogative of the Embassy. You may refer to the link ‘All about Visas’ to understand details of various visas. Complete you visa application form and affix your photograph. You may download the form from this websites. Also, please mention name along with surname of father and spouse, if applicable. Please ensure that you furnish all the required document, you may download document checklist from this website. Incomplete applications will not be accepted. Visit the Netherlands Visa Application Centre during the working hours and receive a token number. Submit your application at the VFS Centre along with the applicable fees in cash. Collect your passport from the Application Centre or wait for courier delivery. Please ensure you read the security regulation notices before you visit the Visa Service Centre. Firstly, download the application form, fill it completely and with sincerity. 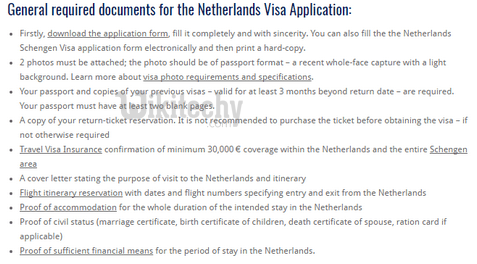 You can also fill the the Netherlands Schengen Visa application form electronically and then print a hard-copy. Proof of sufficient financial means for the period of stay in the Netherlands. The applicable visa fee in Indian Rupees is as per the current exchange rate. The fees need to be paid in cash and are subject to change without prior notice. Please note if you have not intimated staff at the time of submission that you would want to collect the passport from VFS Centre in New Delhi, additional amount INR 300/- will be charged per applicantAll fees should be paid in advance and are non-refundable. The time required to process Visa Applications is upto 15 calendar days under normal circumstances. In case a Representative or Travel Agent is coming to collect the passports/documents he/she needs to carry a Photo Id of himself/herself, applicant's passport photocopy and an authority letter from the applicant. Visa requirements depend upon the foreign individual’s citizenship and his or her intended length of stay in the Netherlands.The Schengen Agreement regulates the Netherlands visa application process. Schengen visas, regardless of which member country issues them, are valid in all member countries for a short-term stay, not exceeding 90 days. EU nationals staying longer than 90 days will need to register with the immigration department. Nationals of Australia, Canada and the USA staying longer that 90 days will need to apply for a long-stay visa. It is important to obtain in advance the correct visa that gives you the right to work in the Netherlands. Work permits and residence visas are easy to obtain if it can be demonstrated that the relevant skills and experience are in short supply within the Netherlands. EU citizens are free to move and work in the Netherlands with a visa or work permit. However, they must apply for a residence permit at their local police station within three months of entry and provide proof of employment or income. If your Netherlands job search and application for the Netherlands visa and Netherlands work permit have been successful you should start preparing for the Netherlands job interview. Do not forget to take a look at Netherlands dress code because how you dress is the one of the most important attribute in being hired. Good luck with your Netherlands visa!